The Old Police House01328 710630work Self-cateringSituated in the heart of the Heritage Coast, the working fishing port of Wells offers miles of beach, pinewoods and salt marsh, ideal for bird watching, rambling, cycling or just relaxing. It is an excellent centre for exploring the many places of interest to be found in Norfolk. You can leave your car in our driveway and explore the area using the award winning Coasthopper bus service. You can visit the Palladian mansion which is Holkham Hall or the Shrine village of Walsingham. The list is endless. If you are not sure what to do we or our extensive range of brochures are here to help. However you may not wish to travel far. From the many shops - with not a chain store in sight - in Staithe Street to the beautiful tree lined Buttlands with its many Georgian houses, Wells is a gem waiting to be discovered. Our annexe is located close to the town centre and quayside, and has all the facilities you would expect to find in well appointed accommodation. "You have thought of everything" is a comment we often hear from guests. The price you pay is fully inclusive of electricity and heating, as well as linen, towels etc. We include a Welcome Pack, which contains some local produce. Situated in the heart of the Heritage Coast, the working fishing port of Wells offers miles of beach, pinewoods and salt marsh, ideal for bird watching, rambling, cycling or just relaxing. It is an excellent centre for exploring the many places of interest to be found in Norfolk. You can leave your car in our driveway and explore the area using the award winning Coasthopper bus service. You can visit the Palladian mansion which is Holkham Hall or the Shrine village of Walsingham. The list is endless. If you are not sure what to do we or our extensive range of brochures are here to help. However you may not wish to travel far. From the many shops - with not a chain store in sight - in Staithe Street to the beautiful tree lined Buttlands with its many Georgian houses, Wells is a gem waiting to be discovered. 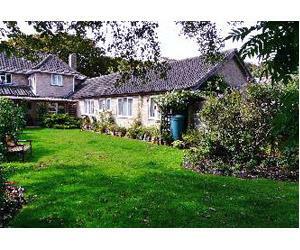 Thus we offer you a comfortable, ground floor, self contained flat in a peaceful garden setting. We live on site and aim to make your stay in The Old Police House a memorable and enjoyable experience. Prices include all linen as provided and electricity / heating costs. In addition we provide a small welcome pack. We believe that initial cup of tea on arrival is essential. Children welcome from any age.